1. Preheat the oven to 190°C, gas mark 5. Oil a 20cm square cake tin. Bring 400ml water to the boil, stir in 1 tsp salt and whisk in the polenta. Whisk for about 3 minutes, until thickened, then remove from the heat and stir in two-thirds of the cheese. Spoon into the tin and smooth level with the back of a spoon. Leave to cool for 30 minutes. 2. Toss the aubergines and onion in 5 tbsp of the oil, season and spread over a large roasting tin. Roast in the oven for 30 minutes, stirring halfway through. Add the tomatoes and vinegar, and roast for a further 10 minutes. 3. 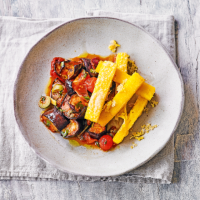 Meanwhile, tip the polenta out onto a board and cut into chunky chips. Toss with the remaining oil and spread over a baking sheet. Scatter over the remaining cheese and bake for 20 minutes until golden. When the caponata is ready stir in the capers, olives and parsley, and serve with the polenta chips. Cook’s tip This dish can be served warm or cold, and any leftovers are brilliant for lunchboxes or picnics.